Pete is recognised as the UK’s leading comedian/magician. He starred in BBC1′s prime-time Saturday night programme ‘The Magicians’. 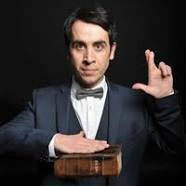 His skill for fusing magic and comedy has made him one of the most in demand magicians working on British television, writing and performing in magic shows such as ‘Monkey Magic’ (FIVE), ‘Dirty Tricks’ and ‘Derren Brown’s 3D Magic Spectacular’ (Channel 4),‘The Secret World of Magic’ (Sky One). He has also made dozens of guest appearances on programmes like ‘The One Show’, ‘BBC Breakfast’, ‘The Sarah Millican Television Programme’,‘Celebrity Mastermind’, Gordon Ramsay’s Cookalong Live’, ‘Comedy Rocks with Jason Manford’, ‘This Morning’,‘Edinburgh Comedy Fest Live’, ‘Comedy Cuts’, ‘Saturday Live Again!’ and ‘Something For the Weekend’. He is also an accomplished television presenter, having fronted the gameshows ‘Stakeout’ and ‘Wait For It’ for BBC1 and ‘The Body Shocking Show’ for E4. ‘Tricks To Freak Out Your Friends’ is Pete’s first book for the public. A beginners magic book for the 21st century. So successful was it in the UK, it was also released in the USA and is about to go into its second print run. Pete has performed 7 years in a row at the ‘Edinburgh Comedy Festival’ as well as the ‘Just For Laughs Comedy Festival’ in Montreal, which is by invite only. He has toured the UK with 4 solo theatre shows, most recently ‘Hoodwinker’ in 2013.